This is the type of monument that I like, and I especially like this one. 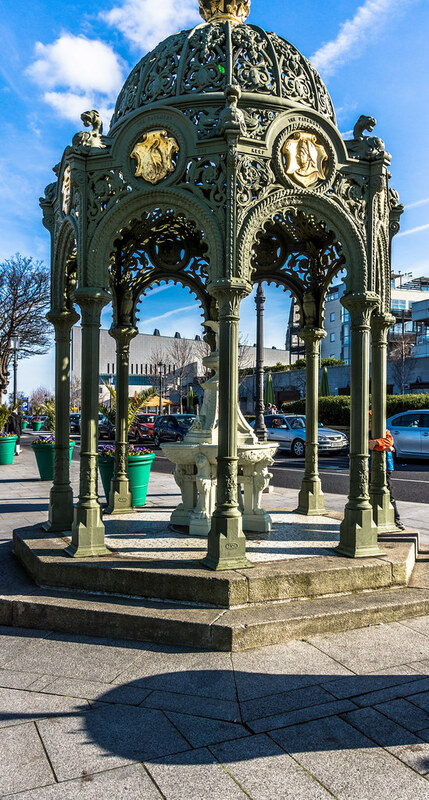 The Queen Victoria Fountain was erected in Dun Laoghaire in 1901 to commemorate her last visit to Ireland in April 1900 when she travelled via Dun Laoghaire harbour. The fountain was erected by Kingstown Town Commissioners and was made by Glasgow company Walter McFarland and Company. In 1981 the fountain was vandalised and badly damaged with the upper canopy and upper portion of the legs torn off. In 2001 the Board of the Dun Laoghaire Harbour Company decided to have it restored. The restored fountain was reassembled on site in February 2003.